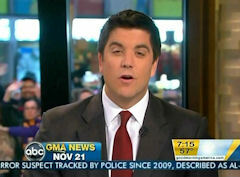 Good Morning America's Josh Elliott on Monday repeated White House talking points in regard to the booing of Michelle Obama at a NASCAR event on Sunday. News reader Elliott played a clip of the booing and then parroted, "The White House says it was a chaotic event. It was not clear, perhaps, what the boos were specifically for." Co-host Erica Hill later repeated, "At other sporting events, this has happened as well. Not everybody always happy but they were there as part of their joining forces initiative to highlight military families." She also asserted, "A little bit of a controversial moment at NASCAR season finale at the Homestead-Miami Speedway over the weekend." Glor provided a more blase attitude, pointing out: "They've certainly heard it before, no matter what side of the aisle you're on." JOSH ELLIOTT: And this morning, the White House is downplaying the reception the First Lady, Michelle Obama, received on Sunday where it appeared that she was booed by fans. ANNOUNCER: First Lady of the United States, Michelle Obama and Dr. Jill Biden, as they deliver the most famous words in motor sports. ELLIOTT: The White House says it was a chaotic event. It was not clear, perhaps, what the boos were specifically for. 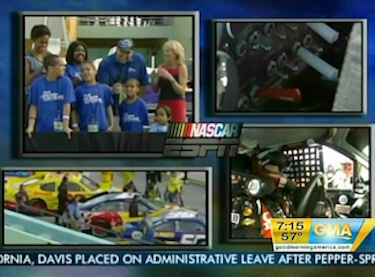 JEFF GLOR: Coming up, a lot of people talking about what happened at NASCAR season's finale last night. And not just about Tony Stewart's win. It's how the crowd reacted to First Lady Michelle Obama and the Vice President's wife Jill Biden. Some people booed them when they showed up last night. They were on hand to honor military troops and their families. We're going to have more on that controversy straight ahead here. ERICA HILL: A little bit of a controversial moment at NASCAR season finale at the Homestead-Miami Speedway over the weekend. GLOR: It didn't involve charges of cheating or an accident. Instead, it was the way that First Lady Michelle Obama and Jill Biden were received by the crowd. Take a listen. ANNOUNCER: First Lady of the United States Michelle Obama and Dr. Jill Biden as they deliver the most famous words in motor sports. MICHELLE OBAMA AND JILL BIDEN: Gentlemen, start your engines. HILL: See, you hear some boos there. Some cheers. HILL: A little bit of a mix and there has been some talk about the boos that happened there. Also, some things written that this was not the first time it happened. HILL: At other sporting events, this has happened as well. Not everybody always happy but they were there as part of their joining forces initiative to highlight military families. GLOR: Yes, they were there and they've certainly heard it before, no matter what side of the aisle you're on. HILL: The beauty of politics, right?